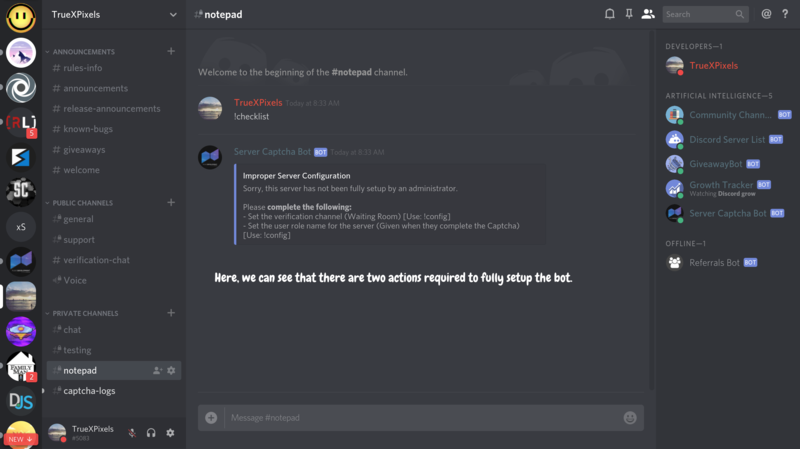 ### Welcome to Server Captcha Bot! Spambots and targeted raids using automated user accounts are real issues for some servers. 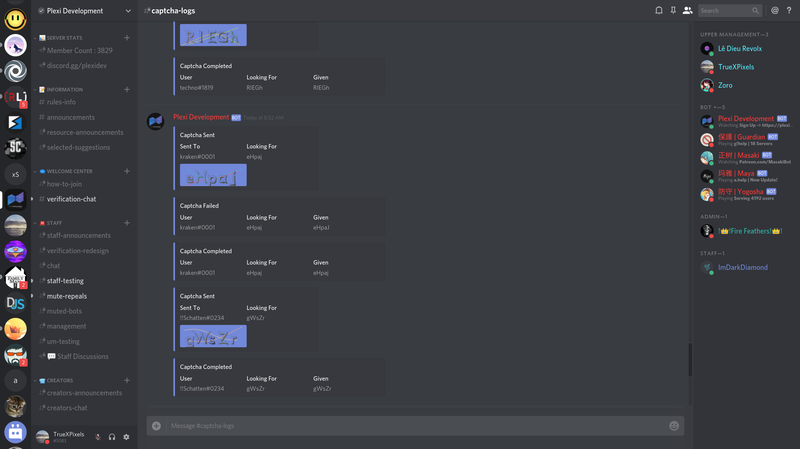 Just in the past few months, I've seen servers with more than 10,000 users get raided using these methods. This bot helps irradicate the fear of your server getting autonomously attacked. --- Want custom branding? 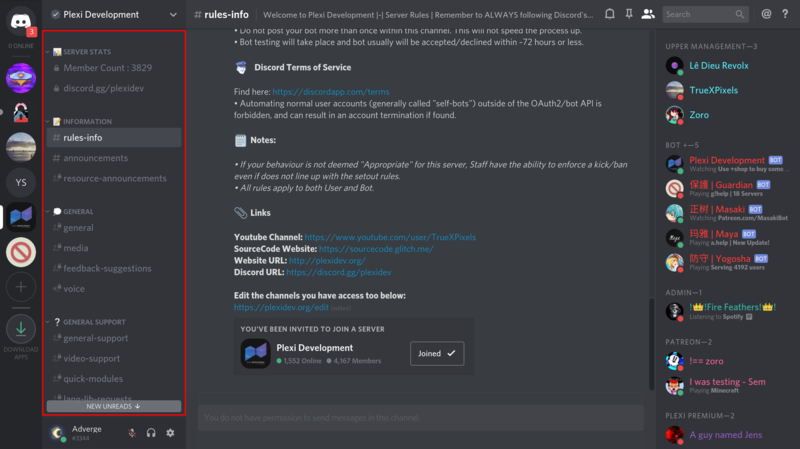 This includes: Independently Hosted (faster), Custom Icon, Custom Bot Username, Custom Prefix, Bot Invite URL Ads Removed, Custom Feature Requests, and more! Check out my Patreon here! Limited Time 20% Off! --- You can invite the bot for yourself here: bit.ly/inviteCaptcha Want to test out the bot before adding it? 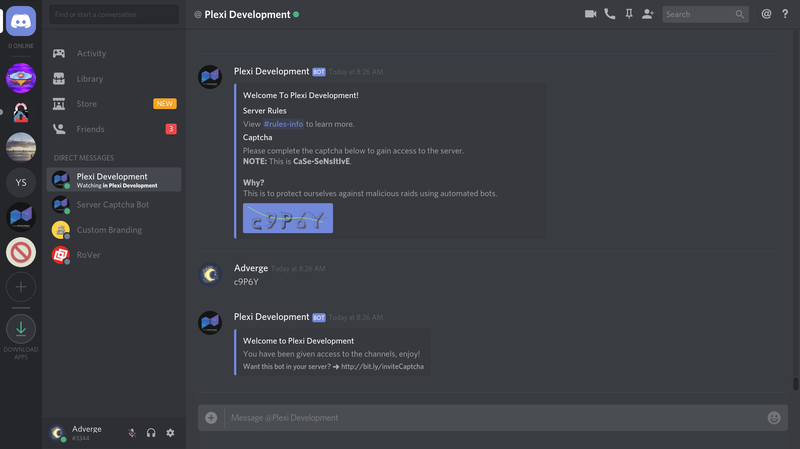 Join here: discord.gg/plexidev There is also a video on this bot, you can check it out here: youtube.com/watch?v=mKGRLyIFF4I --- #### How does it work? 1st - When a user joins the server, they aren't able to see any of the main channels. 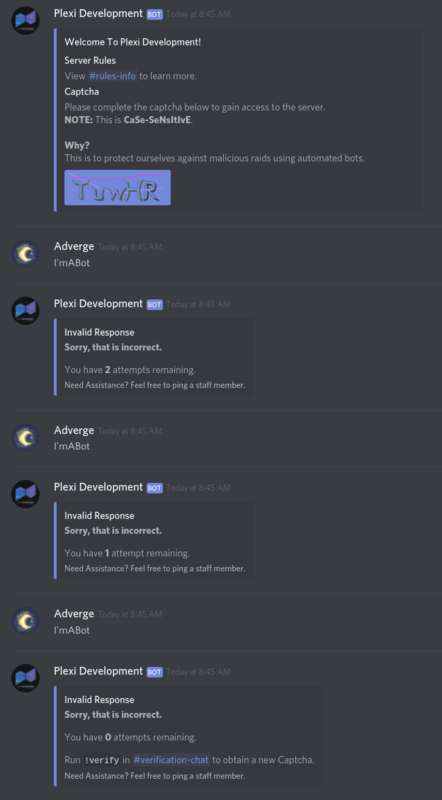 They are also DMed by the main bot, as shown in the corner. 2nd - The user completes the Captcha, and is added to the server. (Image 1: Captcha Completion; Image 2: Newly Accessible Channels) That's it! - It's as simple as that, no interaction needed by administrators of the server. --- #### Setup You might think setting something like this up for administrators would be difficult, although it's not! You can utilize the !checklist command to view a list of actions required for your server to be fully set up. 1st - Complete the list of actions from !checklist. (example below) You're done! - Completing the checklist is all you need to do, it's that simple. (photo below of completed checklist) --- #### Commands Since this bot is highly autonomous, there aren't that many commands required. 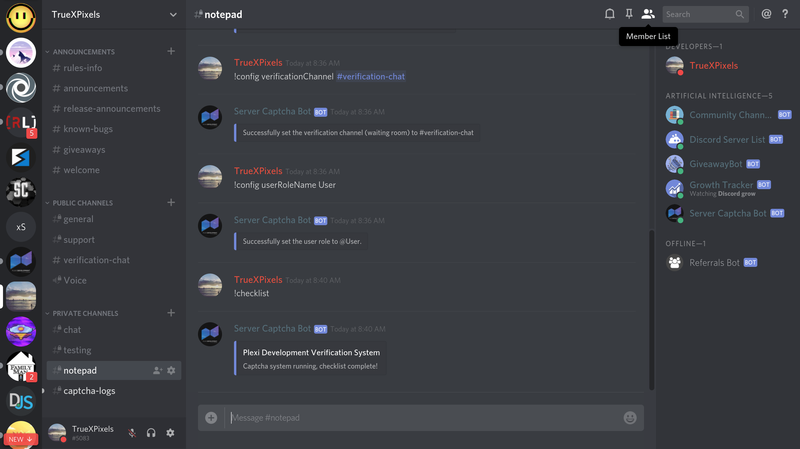 Although, here is the full list: | Category | command | Description | | :---: |:---: | :---: | | User | !verify | Sends a Captcha to the message sender, gives the configured role when completed | | General | !help | Displays a general help message | | General | !votes | Displays the top & most recent voters | | General | !stats | Displays the statistics for the bot | | Admin | !checklist | Displays a checklist of the required actions to set up the bot | | Admin | !config | Display the current configuration for the bot | | Admin | !newCaptcha @user | Forces a Captcha on a specified user (used if they have issues) | --- #### Custom Logging Everyone likes data! 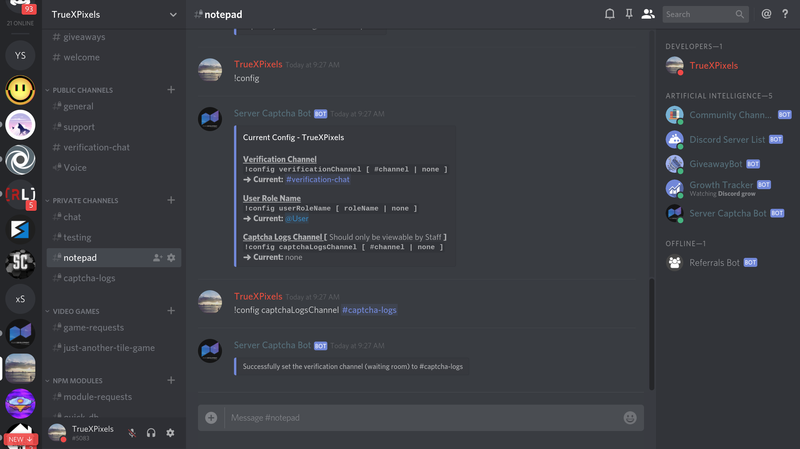 This bot has another feature that allows administrators/staff to view everyone completing the Captcha's in real-time. It can be set by using the !config command. Images: 1st - Setting the channel 2nd - Viewing the channel's data --- #### What if... We don't all enjoy what if questions, but I'll try my best to answer some of the main ones. What if a user has their DMs turned off? 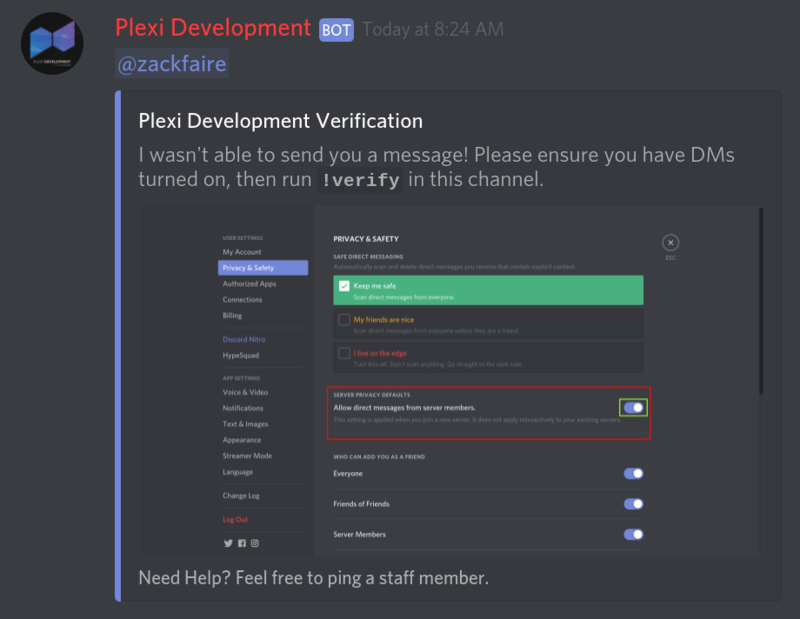 Since the setup requires you to have a verification channel (essentially a waiting room), they are pinged there with an example of how to temporarily turn on their DMs. (image below) What if a user fails the Captcha? 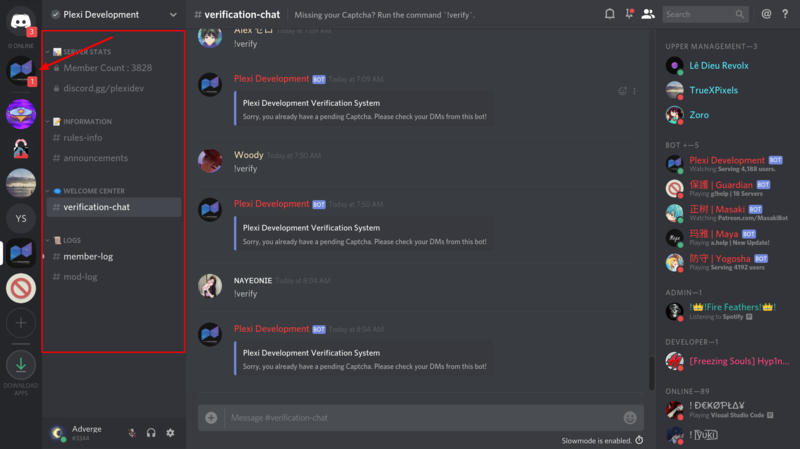 Users get three attempts at the Captcha until they are told to type !verify into the verification channel, which gives them a new Captcha. (image below) --- #### Other Questions Are the Captcha's pre-created? No, all Captcha's are unique and generated when the user requests a Captcha. The bot generates hundreds per day, having preset Captcha's would ruin the security. Are any new features planned? Yes, there are a few features that are planned, mostly relating to backend security. Although, it's better if they weren't known so the people trying to bypass this system will have a harder time doing so.